Traditional Japanese dance, food and fun await during Obon! 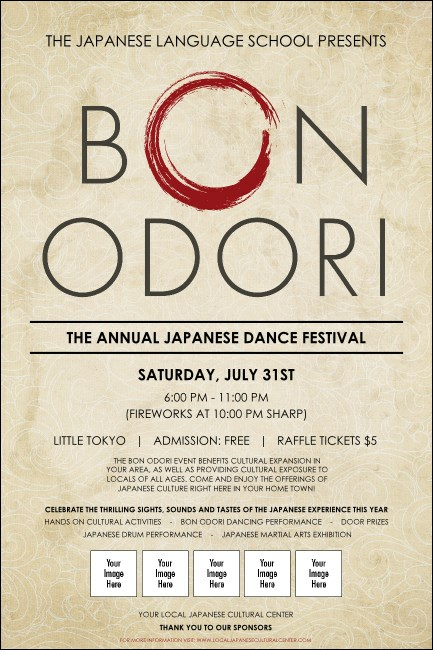 Spread the word about your upcoming celebration with the Bon Odori Poster. A subtle, tea-colored pattern, crisp typeface and a sweep of a red calligraphy brush deliver your event’s information with eye-catching, minimalist style. Thank and spotlight sponsors through this template’s five available logo uploads. Poster’s measurements approximate: 11.46" by 17.18"
Market your event with custom printed posters that capture its atmosphere! Browse myriad templates at TicketPrinting.com.